Ref No Grave or Memorial / Rhif cyfeirnod bedd: Plot 9. Row A. Grave 9. Died of wounds on Friday 22 November 1918 aged 21. John Edward Davies was born in Holywell, Flintshire during 1898. The 1911 census states that the family lived at 6 Dolphin Cottages, Holywell, Flintshire. The head of the family was Hugh Davies aged 38, a Smelter (worked in the Greenfield Iron Foundry). His wife Annie Davies was also 38. Their only son was John Edward Davies, a 13 year old schoolboy. Little is known of his Military Service, but he was with 1st Battalion Royal Welsh Fusiliers on Wednesday 23 October 1918 when they tried to cross the River Piave using the Cozensa Crossing. 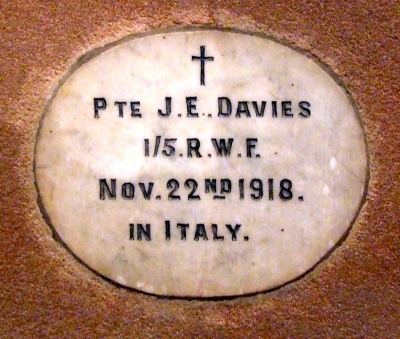 The Battalion was heavily shelled and machine gunned and it was at this time that John Edward Davies was wounded in action. There is a Flintshire Roll of Honour card for John Edward Davies at the County Archives Office, Hawarden, containing very little information. Details of his medals were obtained from (www.forces-war-records.co.uk).